600 mg Guaifenesin. 12 hour. Relieves chest congestion. 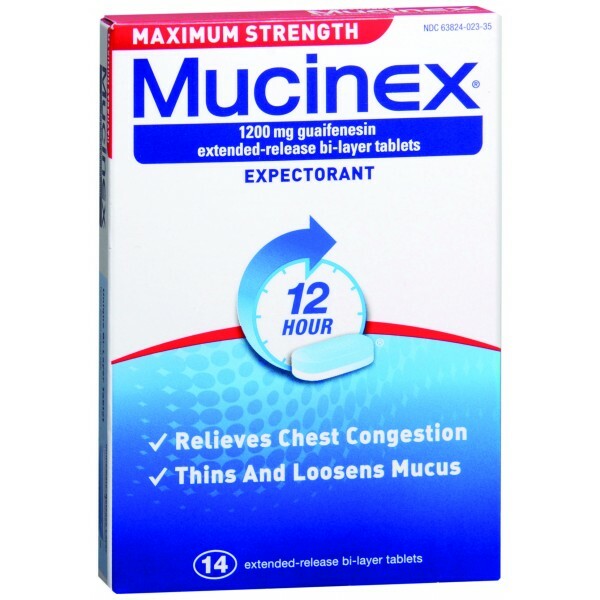 Thins and loosens mucus. Unique Bi-Layer Tablet: immediate-release layer; extended-release layer. 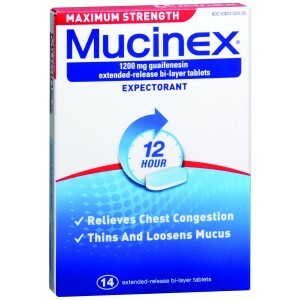 Choose from the Mucinex line of products to treat your symptoms. Active Ingredient (in each Extended-Release Bi-Layer Tablet): Guaifenesin (600 mg). Inactive Ingredients: Carbomer Homopolymer Type B, FD&C Blue 1 Aluminum Lake, Hypromellose USP, Magnesium Stearate NF, Microcrystalline Cellulose NF, Sodium Starch Glycolate NF. Do not crush, chew, or break tablet. Take with a full glass of water. This product can be administered without regard for the timing of meals. Adults and Children 12 Years of Age and Over: 1 or 2 tablets every 12 hours. Do not exceed 4 tablets in 24 hours. Children Under 12 Years of Age: Do not use. Store between 68-77 degrees F (20-25 degrees C). Do not use for children under 12 years of age. Ask a doctor before use if you have persistent or chronic cough such as occurs with smoking, asthma, chronic bronchitis, or emphysema; cough accompanied by too much phlegm (mucus). Stop use and ask a doctor if cough lasts more than 7 days, comes back, or occurs with fever, rash, or persistent headache (These could be signs of a serious illness). If pregnant or breast-feeding, ask a health professional before use. Keep out of reach of children. In case of overdose, get medical help or contact a Poison Control Center right away. Tamper evident: Do not use if carton is open or if printed seal on blister is broken or missing.